Greetings, everybody! Today I finally have the privilege of participating in a 4,000-point game against an Ork player. I always wanted to try my luck against a Stompa with my Adeptus Mechanicus and Imperial Knight list, and I finally have my chance today! Just take note I actually had 2 games today, but I'll start with the Ork opponent before moving on to the Dark Angels one. That's a lot of Orks! That empty space in the center? 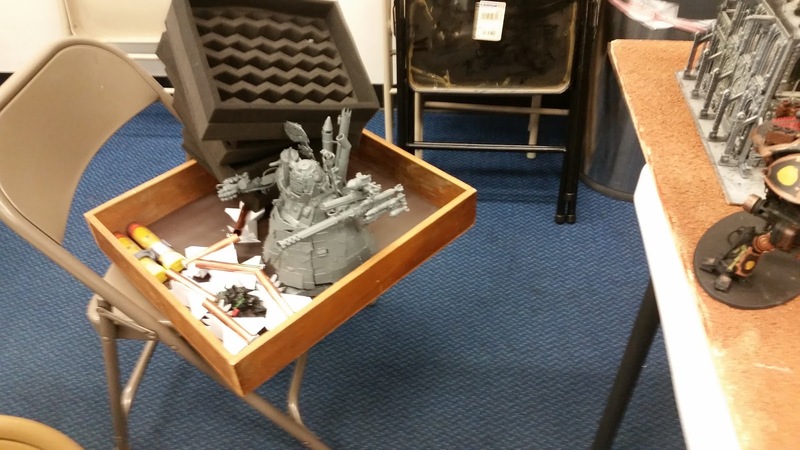 The destroyed Stompa. So it was 4,000 points. 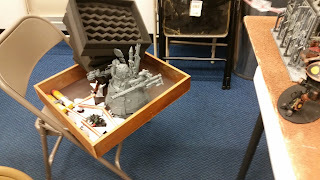 I think the kid brought his Stompa, a squad of Lootas, a squad of Tankbustas, a few Warbosses, Ghazghull Thrakka, a Big Mek, a Painboy, 3 Killa Klans, 1 Deff Dread, 3 Mega Nobz, a bunch of Nobz, and lots of Boyz. Probably 6 squads of Boyz, with 20 loaded up inside the Stompa. Oh, and 3 Deff Koptas. Can't remember if he had Burner Boyz, but I think he did because he had a squad of Boyz with scorchas at the back of his objective. I brought my entire army. That is, Belisarius Cawl, 2 Tech-priests Dominus, 2 Tech-priests Enginseers (which I proxied with my Cybernetica Datasmiths), 2 squads of 5 Skitarii Rangers with 2 transuranic arquebuses each, 2 squads of 5 Skitarii Vanguard with 2 plasma calivers each, a squad of 10 Skitarii Vanguard with 3 arc rifles, 6 Kataphron Destroyers with plasma culverins in a single squad, 3 Onager Dunecrawlers with Icarus arrays, 4 Kastelan Robots, and 3 Imperial Knights - a Knight Paladin with Stormspear rocket pod, a Knight Warden with twin Icarus autocannons and a Knight Errant with Stormspear rocket pod. The objective was burn and pillage, so we had 6 objective markers. The objective was to control our opponents' 3 objective markers and destroy them. My opponent went first, having finished deployment faster than I did, and I rolled a 6 and seized the Initiative. Whoops. Needless to say I destroyed his Stompa. I used the Stratagem to override and change the Kastelan Robots' Protocols to Protector Protocols, used the Elimination Volley Stratagem and the Wrath of Mars Stratagem and put a ton of mortal wounds on the Stompa. By the end of the Kastelan Robots and Kataphron Destroyers' shooting, I basically reduced the Stompa to about 10 wounds out of 40. I think I lost a Kataphron Destroyer to supercharged plasma because despite the re-rolls I had a one. On the other hand, the Skitarii Vanguard, all 3 squads with plasma calivers and arc rifles, wiped out the Lootas, along with the cognis heavy stubbers on one of the Onager Dunecrawlers. The Skitarii Rangers failed to do any damage to Thrakka despite sniping him from afar, while the Onager Dunecrawlers failed to do any damage to the Stompa. They did raze some Boyz with the cognis heavy stubbers on the remaining 2 Onager Dunecrawlers. Adeptus Mechanicus and Imperial Knights preparing for a charge from the Orks! The Knight Paladin killed about 2 Tankbustas, and put a few more wounds on the Stompa, but it was the Knight Errant who blew it up with his thermal cannon. A couple of Boyz died along with the Stompa, but that was it. The Knight Warden wounded one of the Deffkoptas and wiped out a unit of Nobz. The Knight Errant then charged the Deffkoptas and suffered 6 wounds from overwatch due to their rockets. The Knight Warden joined him in combat and between the two of them, they stomped the 3 Deffkoptas to death with their Titanic Feet. With his Stompa destroyed in the first turn before he could do a single turn, all the fight had gone out of my opponent (to be fair, he's just a kid). The Boyz, Mega Nobz, Warboss, Thrakka, Deff Dread all moved up. The Boyz failed to wound my Knight Warden, but the Tankbustas and Killa Klans managed to put 7 wounds on him. On the other side, the Deff Dread scorched a few of my Skitarii Vanguard. I managed to make quite a few saves, but I lost 1 guy in one of my Skitarii Vanguard squads with the plasma calivers, while Thrakka and the Mega Nobz charged and wiped out the other Skitarii Vanguard plasma caliver squad in combat before consolidating to lock the Skitarii Vanguard with 3 arc rifles in combat. Meanwhile, the Boyz attemped to charge my Kataphron Destroyers, and despite re-rolls from 'here we go!, they took casualties and failed their charge. Heh. My opponent had completely lost all motivation to play by now, claiming that he was tired. 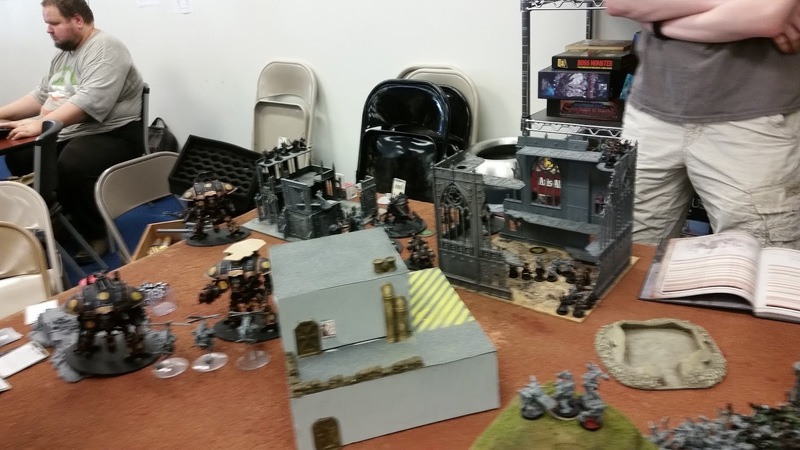 However, Thrakka and the Mega Nobz was near the objective marker my Skitarii Vanguard were guarding, and contesting it (thank goodness for Objective Secured). However, I can't say my guys would survive in combat, so I had them fall back. My Kataphron Destroyers moved up and annihilated the Mega Nobz with their plasma culverins. Thrakka then took a lot of shots from the remaining Skitarii Vanguard squad with plasma calivers and 3 Onager Dunecrawlers before he went down. With that, my opponent conceded and stopped the game. I hadn't fired the weapons on my Imperial Knights or my Kastelan Robots. Oh well. Poor Stompa, destroyed in the first turn before he could fire a single shot. So...a draw? Or my victory? Considering the amount of damage I wrecked on him, killing a few more Boyz with my Onager Dunecrawlers' cognis heavy stubbers and that my other main hitters hadn't fired or chaged yet, well...I can't say it looked very promising for my poor, unfortunate opponent. I felt sorry for him. After that game, another guy came with Dark Angels, bringing a 2,030 point list. I agreed to play against him, but he vehemently protested against playing with Knights. So I adjusted my list and took the Knight out, but I must apologize to him the next time we meet. I miscalculated and accidentally put an extra Onager Dunecrawler in there. Fortunately he didn't do much because my Onager Dunecrawlers fluffed most of their neutron lasers (much like against the Stompa) and spent most of the game doing almost nothing. My list actually hit 2,087, which was 57 points more than his list. This time the objective was Glory Seeker, which was basically kill points. Yeah. And all our units were immune to morale. My opponent brought Azrael, Belial, 3 squads of 10 Tactical Marines with missile launcher and plasma gun, 2 squads of 5 Tactical Marines (I think, I remember he brought 5 Troops), a bike squad with about 6 bikes, I think, a Deathwing Terminator squad of 6, 3 with storm shields, 1 assault cannon, whatever, 2 Venerable Dreadnoughts, a Rhino and a Razorback with twin assault cannon. 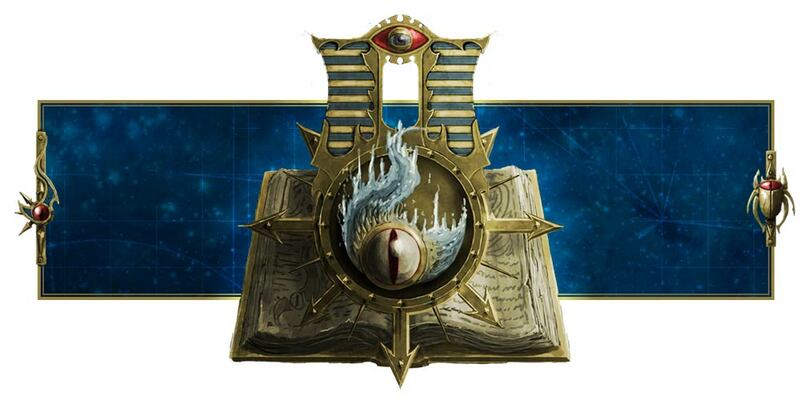 I brought Belisarius Cawl, a Tech-priest Dominus, a Tech-priest Enginseer, 2 squads of Skitarii Vanguard with 2 plasma calivers each, 2 squads of Skitarii Rangers with 2 transuranic arquebuses each, 6 Kataphron Destroyers with plasma culverins in a single squad, 4 Kastelan Robots and 3 Onager Dunecrawlers with neutron lasers. Again, I must apologize sincerely for my mistake (and I'll apologize to him when I saw him) because I miscalculated the number of points I took out for my Knight to slot new units in and accidentally included an extra Onager Dunecrawler. This time I failed to seize the Initiative and he went first. My opponent moved all his units forward and Deep Strike his Deathwing Terminators behind my Kastelan Robots. Despite all their shooting, they only put one wound on a Kastelan Robot. The other units fared better, completely wiping out one Skitari Vanguard squad, and killing 3 in another to leave only 2 plasma caliver guys behind. The Skitarii Ranger squad on my right was decimated to just one sniper. The Terminators then charged and I think I only put one wound on them through Overwatch. Thankfully, they failed their charge. 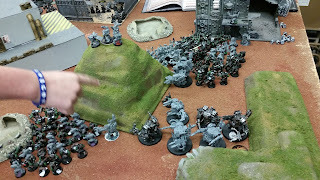 I then retaliated, using my Kataphron Destroyers to destroy the Terminator Deathwing squad with supercharged plasma, but I lost 2 of them this time. Whoops. At least I got rid of the plasma dudes. Phew. Needless to say, my Onager Dunecrawlers fluffed their shots, and only put a total of 3 wounds between the 3 of them on a Venerable Dreadnought. They fared better with their cognis heavy stubbers and took out about 3 or 4 Space Marines in a tactical squad. The 2 plasma caliver guys managed to kill a single biker. Oh, and the Skitarii Ranger snipers? They absolutely did nothing. Then my Kastelan Robots absolutely murdered everything. I used Binaric Override Stratagem to switch their Protocols to Protector and then, one by one I swept their heavy phosphor blasters across the table. I used Wrath of Mars and piled on the mortal wounds. I erased 2 tactical squads and the entire biker squad with just the 4 Kastelan Robots alone, having them shoot at a different target. Suddenly my opponent lost almost half his army, and his forces looked very empty. The Venerable Dreadnoughts continued to move up, as did Azrael and another tactical squad with missile launchers and plasma gun. So did the Rhino and Razorback, and Belial came from the back. They shot off the sole surviving sniper on the right, put 5 wounds on one of my Onager Dunecrawler and killed 2 more Kataphron Destroyers, leaving just 2 left. Belial then charged my Kastelan Robots, but with them in Protector Protocols, they fired 72 shots in overwatch and killed him. Poor Belial. I repaired 2 wounds on my Onager Dunecrawler. My plasma caliver guys continued to move up and shoot the tactical squad, maybe killing one or two more. The Onager Dunecrawlers fired, but again poor shooting saw them put the first Venerable Dreadnought down to one wound and the other to four wounds. The remaining Skitarii Ranger squad fired their transuranic arquebus and I only scored a single mortal wound with a wound roll of 6 on Azreal, but he otherwise made his invulnerable save. The Kastelan Robots then opened up, one killing the Venerable Dreadnought, another wiping out the tactical squad, and the others putting 2 wounds on the 2nd Venerable Dreadnought and 2 wounds on the Rhino. The Razorback, Rhino and Venerable Dreadnought continued to move up, while Azrael hopped into the Razorback to seek shelter from the snipers. They killed the last 2 Kataphron Destroyers, put another 2 wounds on a Kastelan Robot. Uh, I think that was about it. I destroyed the Venerable Dreadnought with another mortal wound from my sniper and an Onager Dunecrawler. The other 2 fired and destroyed the Rhino, while the 2 plasma caliver dudes overcharged and shot the Razorback. The Kastelan Robots then killed the 10 tactical marines in the Rhino and destroyed the Razorback, allowing Azrael and the last tactical squad to jump out. I then recklessly charged them with my 2 remaining Skitarii Vanguard, and they were slain in overwatch. Whoops. Azrael and the tactical squad continued to move forward amd attacked my Kastelan Robots, but not doing much with their shooting. Instead, they assaulted my Kastelan Robots, and despite 72 shots in overwatch, I failed to kill the tactical marine. About 3 survived and whacked my Kastelan Robots, and Azreal joined in. My Tech-priest Dominus did a Heroic Intervention and joined combat, but basically I managed to either make my saves or he didn't wound any of them. My Kastelan Robots killed one guy in combat while my Tech-priest Dominus did about 2 wounds on Azreal, leaving him with 3. Since we were still locked in combat, I couldn't do anything except have Belisarius Cawl move over and charge Azrael. My Kastelan Robots killed a second tactical marine in combat while not receiving any wounds back in return. On the other hand, Belisarius and the Tech-priest Dominus managed to deliver 4 wounds between them to slay Azrael. Awesome. With only a single Sergeant left on the table and practically tabled, my opponent conceded defeat. He failed to kill any of my hard hitters, Characters or vehicles, while I had basically tabled him. I think he only wiped out 4 infantry squads - 2 Skitarii Vanguard squads, 1 Skitarii Rangers squad and the Kataphron Destroyers. He couldn't even kill a single Kastelan Robot. Even if I didn't include the 3rd Onager Dunecrawler, who fluffed his neutron laser shots, I'm not sure if the outcome would have changed much. The Kastelan Robots just did too much damage. So yeah, two great victories today (albeit one of them being a terrible mistake on my part and a poor miscalculation, so I must apologize to him next time) and I'll continue playing and updating you guys. Once I get my new Imperial Guard army formed, I'll try games with them and let you know how they turn out!